Thyroid gland enlargement is a condition which is characterized by an enlargement of the thyroid. It could be caused by normal changes in the body like pregnancy, menstruation and puberty, or by diseases like Thyroiditis (infection of the thyroid), Tuberculosis, Syphilis, Hashimoto`s disease, and Iodine deficiency or Cancer. With thyroid enlargement thyroid hormone could be normally produced (euthyroid), or increased (hyperthyroidism), or decreased (hypothyroidism). Left thyroid lobe enlargement due to hyperthyroidism shown in blue colour, normal thyroid tissue shown in pink colour. 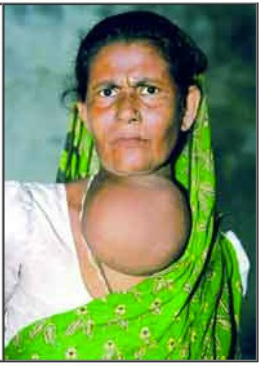 The generalized enlargement of the thyroid is called goiter, with most large thyroid enlargements seen in developing countries due to iodine deficiency. These goiters are asymmetrical, soft, and can reach enormous sizes. Anaplastic carcinomas (thyroid cancer) may also cause large thyroid swelling. Bleeding in the thyroid cyst cause thyroid enlargement as well. 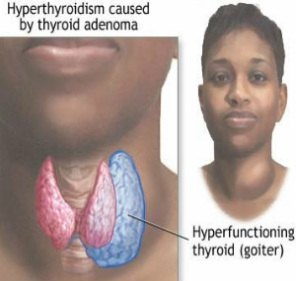 Thyroid enlargement (goiter) due to iodine deficiency is less common now because iodine is added to the diet. Symptoms usually include compression of the nearby structures, and result in hoarseness of the voice when the recurrent laryngeal nerve is involved. Stridor is an abnormal high-pitched musical breathing sound, and results if the trachea (windpipe) is displaced or compressed.